Alexandra Ballet celebrates its 20th Anniversary season this year with its most ambitious and innovative schedule of performances and educational initiatives to date. In a departure from our usual offering of a full-length ballet each spring, this year, in celebration of our anniversary, and to thank the community for its continued support, Alexandra Ballet offers a special gift, Musical, Magical, Moving-A 20th Anniversary Celebration of Dance. This exciting repertory program is filled with excerpts from our favorite classics performed through the years, as well as newly choreographed contemporary works. Esmeralda-Music by Pugni, choreography by Perrot. Based on the tragic tale of "The Hunchback of Notre Dame" and first performed in 1844, this excerpt portrays the beautiful Gypsy girl, Esmeralda, as she has just discovered that the man she loves is about to marry another. Her friends gather at her side, encouraging her to dance in order to forget her troubles. Harlequinade-Music by Igor Stravinsky, choreography by Dace Dindonis after Petipa. The fun and slapstick, as well as the deeper meaning of the historic popular Italian comedy called commedia dell 'arte, appeals to all ages, as Harlequin succeeds in rescuing Columbine from the wealthy suitor her father has picked out for her. Pagosiana-Music by Mark Isham, choreography by Sharon Randolph. This contemporary ballet was created on the Apprentices of Alexandra Ballet. Pagosiana is a stirring, reverent abstract depiction of the birth of a new galaxy. Pas de Deux from Le Corsaire-Music by Adam, choreography by Petipa. The story of Medora, a Greek girl who is sold into slavery, is most popular in Russia, where it remains active in the Kirov repertoire. 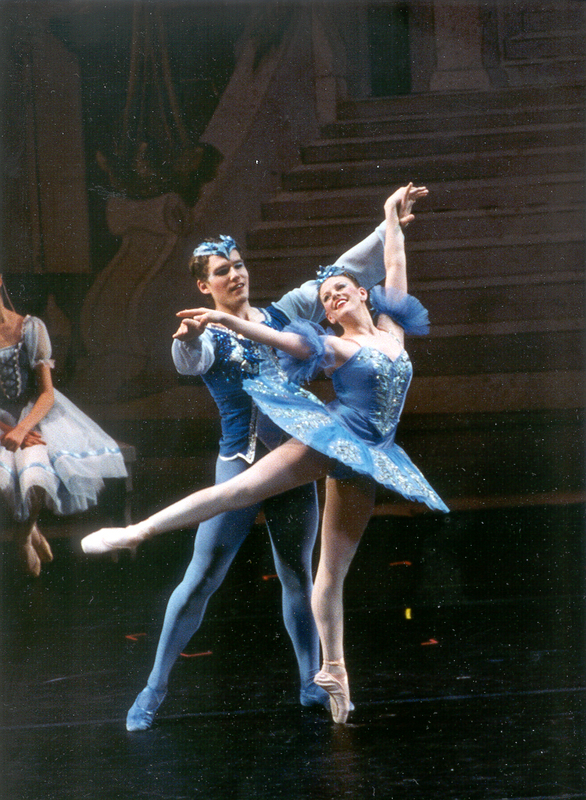 In the West, however, the ballet is most often represented by this pas de deux, whose extrovert demeanor and virtuoso choreography make it a gala favorite. Pas de Deux from Swan Lake, ActII-Music by Tchaikovsky, choreography by Petipa-Ivanov. Swan Lake is arguably the most popular of all classical ballets. It is the touching and magical story of Odette, the Queen of the Swans, who lives under the spell of the evil sorcerer, Von Rotbart, and her love for Prince Siegfried. This romantic pas de deux depicts the initial meeting of the two lovers, and their tentative expression of first love. La Bayadère (The Kingdom of the Shades)-Music by Minkus, choreography by Petipa. Renowned guest artists from Colorado Ballet, Maya Makhateli and Nathan Vander Stoep, join the dancers of the accomplished company in this otherworldly classic. This is the story of Nikiya, an Indian temple dancer, and Solor, a young warrior who betrays her love. In this, the final act, the repentant Solor dreams that he seeks his beloved in the "Kingdom of the Shades." An unforgettable ballet, the audience will be mesmerized by the descent of the dancers down a long ramp at the back of the stage, all in profile to the audience, in arabesque penché with each step. This piece includes one of the most famous and beautiful pas de deux of all time, as the characters of Solor and Nikiya dance together, with Solor pledging that he will never forsake her again. Blanche M. Touhill Performing Arts Center , UMSt. Louis Campus, St. Louis, Missouri. Click here for directions. Tickets go on sale at the Blanche M. Touhill Performing Arts Center on Wednesday, January 26, 2005. Box Office hours are Monday thru Friday between 10:00 am and 6:00 pm. Click here for directions. Phone orders can be placed by calling (314) 516-4949 or toll free number (866) 516-4949. There is a $3 charge per phone order. Tickets will be mailed directly to you. All tickets purchased over the phone must be charged to MasterCard, Visa, or Discover. Click here to buy tickets on-line. Tickets can also be ordered by stopping at the studio. These special performances will include Esmeralda. Harlequinade, and Pagosiana. Students will also get an extraordinary opportunity to learn about the magic at the backstage from a presentation by the stage manager of the production during the intermission between Harlequinade and Pagosiana. Reservations for school performances, offered free of charge to area students and educators, were filled months in advance. Alexandra Ballet prepared Alexandra Ballet's Educational Booklet that is designed as a resource for teachers to provide specifics about this performance, as well as a broad spectrum of learning materials that might be used in classroom. The Educational Booklet is in Adobe PDF format. You must have an Adobe Acrobat Reader to open the file.